The CERES EcoHouse is a sustainable display home that provides working examples of sustainable features that can be added to existing housing stock. The house is open to the public last Saturday of the month from 10am to 1pm. Entry is free. Established in 1983, the house was relocated from nearby to CERES so it could be renovated and be easily accessible. The house has a live in caretaker, and shows how to convert existing housing stock to signficantly reduce our individual impacts on the earth by changing the way we do things without changing our lifestyle. 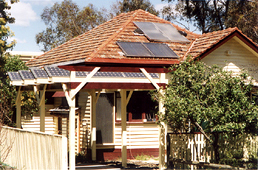 Origin Energy initially provided some funding for the ongoing maintenance of the house, but no longer support the Saturday open days. This page was last modified 07:36, 22 November 2008. This page has been accessed 29,575 times.